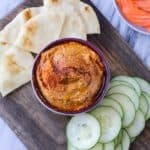 This easy harissa hummus is a delicious way to elevate your dip. Perfect with crunchy veggies or salty pita chips, this recipe is great for a crowd! Place the chickpeas in a microwave safe bowl and cook on high for 1 minute. Transfer the chickpeas to a blender and blend on high for 20 seconds. Add the rest of the ingredients and continue to blend for 2-3 minutes until completely blended. Add an additional tablespoon of harissa paste and gently swirl in. If you’re not serving it right away, store in the fridge and stir in a bit of water before serving, as the hummus will thicken when chilled.